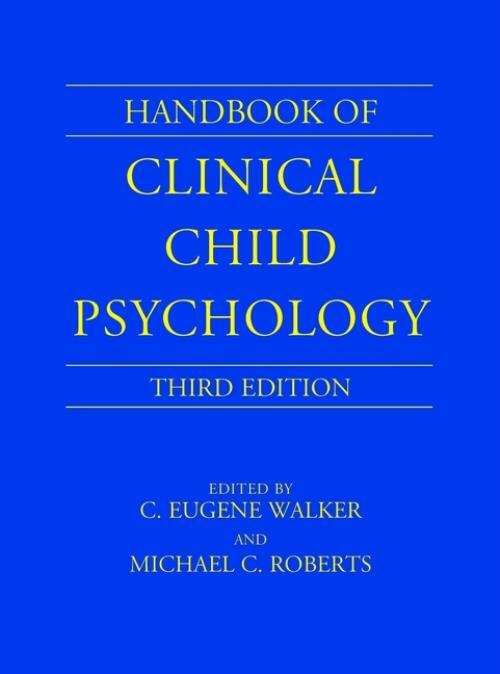 The increasing focus on children′s welfare has given rise to tremendous growth in the field of child psychology, and the past decade has witnessed significant advances in research in this area. Families and Children in History (R. Olson). Developmental Models and Clinical Practice (R. Simeonsson). Interviewing Strategies in Child Assessment (S. Eyberg). Assessing Children Through Interviews and Behavioral Observations (A. LaGreca). Objective Assessment of Children′s Behavioral and Emotional Problems (S. McConaughy). Prenatal and Genetic Influences Upon Behavior and Development ( J. Elbert). Clinical Problems of Birth, the Neonate, and Infant (A. Sostek). Fear and Anxiety in Children (A. Albano). Evaluation and Treatment of Sleep Disorders in Children (J. Ware). Toileting Problems in Children (E. Christophersen). Attention Deficit–Hyperactivity Disorder (A. Anastopoulos). Disorders of Communication (L. Richman). Common Adolescent–Parent Problems (W. Rae). Emotional Problems of Adolescents (A. Weiner). Deliquency and Criminal Behavior (W. Shaw). Parenting: The Child in the Context of the Family (R. Jackson). Behavior Therapy with Children (S. Powers). Cultural and Ethnic Diversity Issues in Clinical Child Psychology (R. Jones). Education and Enrichment Approaches (P. Weisberg). Ethical and Legal Issues (G. Melton). Forensic Evaluations of Children and Expert Testimony (A. Schaefer).